Change the way you look at Luxury. Complete with superior quality and stunning features, these impressive inclusions will truly enrich your sophisticates and elegant family life. Best of all, these premium inclusions and style choices all come at no extra cost. 1000mm wide Caesarstone ® benchtop with cupboards to rear of island, and deeper kicker floating effect. Benchtop available in 20mm or 40mm Caesarstone . 1000mm wide Caesarstone® benchtop with waterfall ends and rear with laminate back panel recess. Benchtop available in 40mm Caesarstone® only. 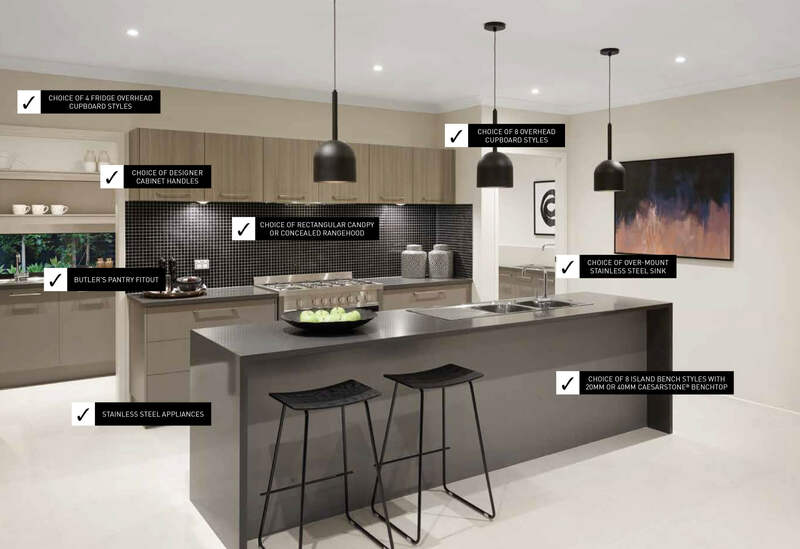 1000mm wide Caesarstone ® benchtop with waterfall ends, laminate feature surround and three cupboards to rear of island. Benchtop available in 40mm Caesarstone ® only. 1000mm wide Caesarstone ® benchtop with shadow line and laminate open shelf to rear corner of island. Benchtop available in 20mm or 40mm Caesarstone ®. 720mm high overhead cupboards to both sides of canopy rangehood. 520mm high overhead cupboards with open shelf below to both sides of canopy rangehood. 720mm high open shelves to one side of canopy rangehood. 600mm high overhead cupboards with concealed rangehood. Laminate rangehood housing with concealed rangehood and 400mm high overhead cupboards with open shelf below. 600mm high overhead cupboards with concealed rangehood and open shelves to one side of rangehood. Laminate cabinetry doors [choice of shelving, door or drawers to centre panel]. Caesarstone ® benchtop available in 20mm or 40mm including recessed shadow line finish. Laminate cabinetry doors (choice of shelving, door or drawers to centre panel). 33mm laminated benchtop and surrounds to all four sides of the vanity. Wall hung floating vanity in slab style with thick stone benchtop. Laminate recess and 33mm laminate surround to all four sides of the storage drawers. Slab style Caesarstone ® vanity top including laminate doors and laminate open shelf below. His & Hers vanity with Caesarstone ® benchtops with recessed shadow line under and laminate open shelf between vanity cupboards. Benchtops available in 20mm or 40mm Caesarstone ® . Note: Individual mirrors for this option. 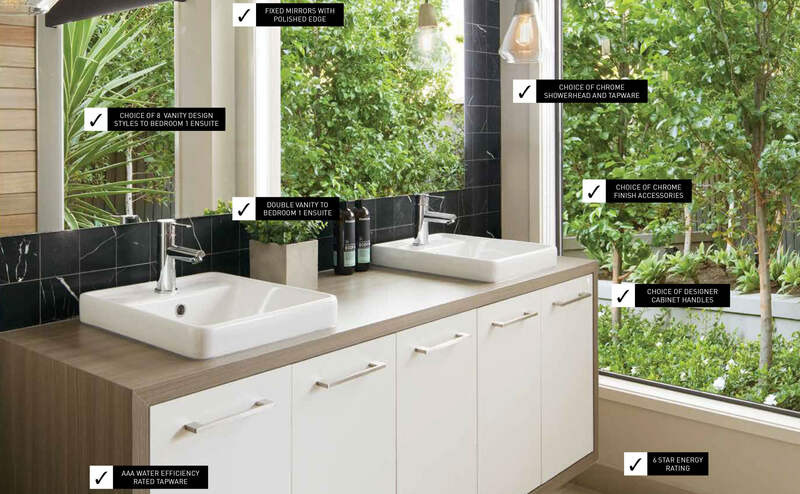 Block style laminate vanity with laminate cupboard doors (choice of shelving, door or drawers to centre panel) and Caesarstone ® benchtop with waterfall ends. Benchtop available in 20mm or 40mm Caesarstone ®.